She’ll say I do when you create a custom diamond engagement ring at Jewelry Design Gallery! Creating jeweled visions since 1984, Jewelry Design Gallery has unique engagement rings whether they’re one of a kind or designer made that will have her saying yes to the ring. From the latest in CAD/CAM (Computer Aided Design and Computer Aided Manufacturing) technology to high-level customer care, our expert designers work “hand-in-stone” to create dreams in diamonds for clients looking to give the loves of their lifetimes a ring that says I love you—forever. If your love’s heart set is on one of the most fashionable or classic designer engagement rings, come to our shop to let our expert jewelers guide you in your diamond shopping, from A to Z. 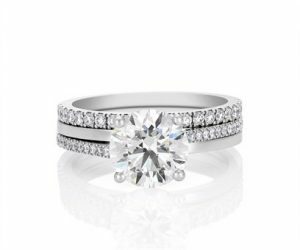 We create the best of the best engagement rings for women and pride ourselves on educating our clients to understand everything there is to sparkle about in diamonds and diamond jewelry. Since 1984, our clients have come to us to buy from our selection or build their very own unique engagement rings because of our high-level care and love for our clients and jewelry. All it takes is a little inspiration—whether it’s a sketch, picture or magazine idea, our jewelers will have you drooling over the ring you choose to put on her finger. Come explore our engagement rings for women or talk to us about creating your own diamond dream today! Schedule your appointment today at (732) 536-1184.